AFC Telford United loan player Kyle Dixon has upset manager Steve Kittrick by telling him that he wants to leave - barely a fortnight after coming in. The 20-year-old defender was scheduled to spend the rest of the season at the Bucks Head following his arrival on loan from Notts County on 2 January. But he now wants to return to Conference North side Boston United, where he had previously been on loan. "He's done himself a lot of harm with Notts County and us," said Kittrick. Dixon has made two second-half substitute appearances since coming to Telford, but he had clearly arrived expecting to be part of the starting line-up. "He rang me on Sunday and told me that because he's not playing he wants to go back to Boston," Kittrick told BBC Radio Shropshire. 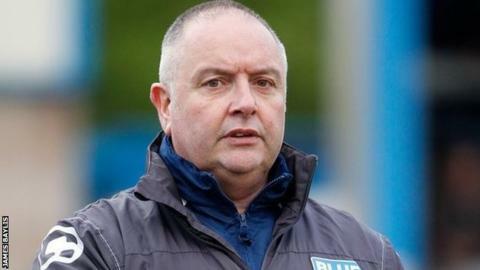 Telford's hopes of a run in the FA Trophy under Steve Kittrick were ended by their 4-0 second round thumping at Conference North leaders Fylde. After beating Conference rivals Chester on penalties in a first-round replay at Bumpers Lane in his first game in charge, the three-times winners had hopes of progressing much further. But, after Liam Tomsett's early goal for Fylde, who are unbeaten at home this season, three more late strikes from Danny Rowe (2) and Josh Wilson finished off the Bucks. "Apparently they can't recall him, as he's signed with us on a long-term loan and he can't go back, so I'm afraid he's going to be sat in the stands unless something miraculous happens. "That's what you've got to manage sometimes. Immaturity in a player. To be fair to the kid, he's killed himself because he signed for us and has to stay with us. I don't want a player that doesn't want to be at Telford." Dixon was left out of the squad by Kittrick for Tuesday night's twice-postponed 4-0 FA Trophy second-round defeat at Fylde. Just three days after winning at Wrexham by the same 4-0 scoreline, Telford put in a feeble performance in wintry Lancashire as Kittrick's side lost for the first time in six games since he took charge on 22 December. "As good as we were against Wrexham on Saturday, we were as poor here," added Kittrick. "People haven't wanted to put a foot in. "Psychologically, some of them have turned up and thought, after Wrexham, we'll beat these easy. But they got about us in the first 10 minutes and there was only one winner."